“Burnt” is Bradley Cooper’s “Cocktail,” a trendy, slick and superficial romance built around a seriously one-dimensional performance. It’s a foodie movie whose credits are riddled with big-name chef consultants — Gordon Ramsay, Mario Bitali. The meals are Michelin Guide ready and sumptuous, the kitchen details often just right. But the star displays all the range of a light switch — “on,” he’s a swaggering, arrogant but charming cook who is “almost as good as I thought I was.” “Off,” he’s an insufferable, short-tempered jerk, hurling dishes, cursing subordinates and flipping out. About food. Adam Jones (Cooper) once had it all — a place in a prestigious Paris restaurant, the love of his mentor/boss, the hand of the boss’s young, French daughter. But he blew it all, mainly through drugs. If you’ve ever read Anthony Bordain’s “Kitchen Confidential,” you know this is a pitfall of the trade. Crazy hours, arduous work — something “Burnt” gets at by showing the grueling cleaning the cooks and chefs carry out — good money, often spent on late-late-night recreation. “Drinking, sniffing, injecting, licking yellow frogs…and women” is how Adam explains it. He did his penance, shucking one million oysters in New Orleans. He counted. Now, he’s sobered up and “going after my third (Michelin) star.” In London. Daniel Bruhl is the rich daddy’s boy he bullies into letting him take over his restaurant. Emma Thomson is the shrink Bruhl’s character commissions to give Adam frequent drug tests and off-the-cuff counseling. Omar Sy is the forgiving enemy he ruined back in Paris, here taking on sous chef duties. Mathew Rhys is Reece, the “New Cuisine” king/rival to Adam’s “Old School” “butter and shallots” zealot. 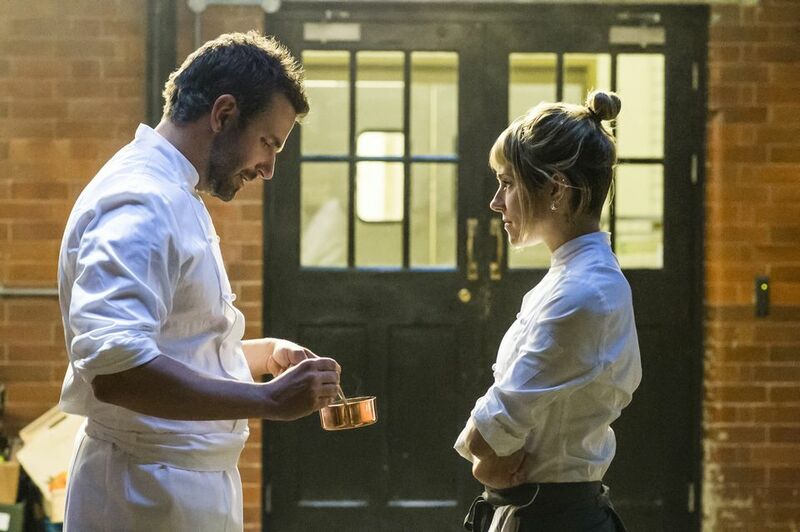 And Sienna Miller is the simmering soul of “Burnt,” the final piece to Adam’s team, a reluctant subordinate and single-mom sure to make Adam give us his vow of chastity. He gets the milieu right, with its Gordon Ramsay-style tantrums, time-pressure perfectionism and “Yes, chef” hierarchy among the tattooed, nicked and burned cooks. Adam is set up as a working class Joe who hates food snobbery, a scene nicely underlined in a Burger King. But he’s a screechy, preachy character, full of blustering pronouncements about food and haute cousine — as handsome as Cooper can make him, and as vapid. Watch Miller act rings around him in their scenes, tune into Rhys as he passes judgment on his rival. “Burnt” isn’t a bad movie, but the melodrama is overwrought and overdone, the romance warmed over and the “Cocktail” formula shaken, stirred and utterly played. Credits: Directed by John Wells, script by Steven Knight. A Weinstein Co. release.